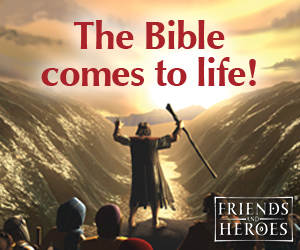 The following crafts and games come from the Bible lesson "Peter Heals the Lame Man" on The Resource Room. 1. Print out the patterns onto card stock, cut them out, and color them. 2. Punch holes using a hole punch in the leg pattern and the neck of the head pattern. 4. Fold the head pattern at the neck and string it onto the other end of the yarn and tape it to the bottom of the cup. Tape the yarn that is behind the head pattern to the back of the head. Tie the end of the yarn to a craft stick. 5. Fold the arm patterns and tape them to the cup. 6. You can also tie heavy duty thread to the feet and to the ends of the craft sticks to make a marionette. If you have younger children, you can just let the legs hang. They can make the puppet dance by moving the craft stick and tapping the feet pattern to a table. Copyright 2012, Digital by Design, Inc. 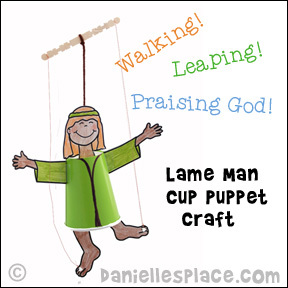 This Bible character puppet can be used with many different other Bible stories including: Lessons on praise and worship, David dancing before the ark of the Lord, and The Parable of the Lost Son. Kerry Beck from How to Homeschool My Child used this craft in her SHIP VBS to reinforce the Bible lesson about Joseph and the importance of being diligent. 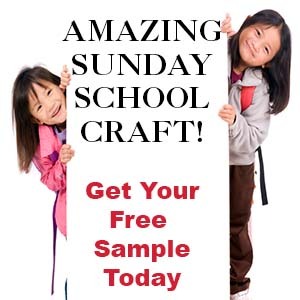 Check out her Website for some great tips on how to prepare and present this craft, and for detailed information about the material she used for this VBS. 1. Before class print out the activity sheet and the leg patterns onto card stock. 2. Cut out the leg patterns. 3. 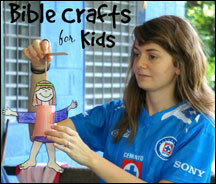 In class have your children color the pictures and attach the legs with brass fasteners. Foam Core Board, or a Cardboard Box at Least 8" x 8"
1. Before class prepare questions about the lesson and/or previous lessons. 2. Mark a start and finish line in your room with painter's tape (blue tape). 3. Prepare the spinner game - Print out the pattern and glue it to a piece of foam core board or a cardboard box. Stick a paperclip to the center using a thumbtack. Don't press down on the thumbtack to hard or you won't be able to spin the paperclip. 1. Have your children line up along the start line, and have them take turns answering a question. If the child answers the question correctly, he or she gets to spin the spinner and move according to what he or she has spun. If the spinner lands on "walking", the child takes one step forward. If the spinner lands on "Leaping" the child jump with both feet together as far as he can. 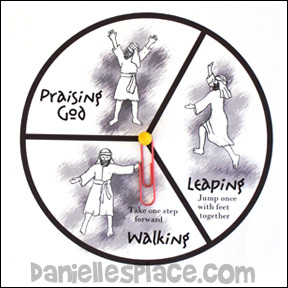 If the spinner lands on "Praising God!, the child raises his hands above his head, says "Praise God", Hallelujah, or other praise words and jumps or steps forward two steps or jumps. The child that reaches the finish line first wins. If you have big kids and little playing at the same time, start the little kids farther forward than the bigger kids.